Creating networks in Windows 7 is easier than ever, but setting up a secure wireless network takes a little bit more thought. Every wireless network — even home or small-business networks — should have security protection. The first law of wireless networks pertains: Any default installation of a wireless network is absolutely wide open and vulnerable to the most casual eavesdropping. If you don’t lock your wireless network down, somebody’s going to blow it away. Depending on your router, most Windows 7 computers offer three different levels of protection. WEP (Wired Equivalent Privacy) is the oldest and most vulnerable. WPA (Wi-Fi Protected Access) is much better, but WPA2 is better still. Choose the highest level that all the computers in your network can handle. Check your manufacturer’s instructions to find out the default username, password, and broadcast network name (usually called an SSID) for your wireless access point. Make sure that your WAP (broadband router, whatever) is plugged in and all its lights are blinking. For now, don’t plug in your Internet connection. Let’s just work with the WAP for the moment. Connect a network cable from your Windows 7 PC to the WAP. When you plug in the WAP, Windows 7 identifies it as a new network. Tell Windows that you’re on a public connection for now. Though it’s true that you can set up a wireless access point using a wireless connection, it’s much simpler if you attach a Windows 7 PC directly to the wireless access point with a network cable. Otherwise you’ll find yourself having to reconnect several times. Type the username and password you found in Step 1. In this case, the username is blank and the password is admin. Click OK. The main Administration page for your WAP opens. They’re all a bit different, but they all contain some information that’s common to all access points. Don’t mess with anything you don’t understand! Lots and lots of settings inside the router can render it useless — and you have to reset the whole machine to get it working again. On the Linksys router, click the Administration tab. Type the new password twice. The access point or router reboots itself when you click Save Settings. When it returns to life, you see a logon screen. Be careful to save your changes. 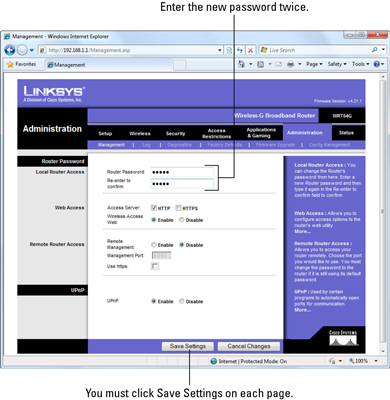 Every manufacturer works differently, but Linksys requires you to click Save Settings at the bottom of each page. If you go to a different tab without clicking Save Settings, your changes are thrown away. Type the username and new password, and click OK.
You’re back inside the access point or router. Your second job is to change the broadcast network name or SSID. On the Linksys router in the example, click the Wireless tab, and you see the network name settings. If you broadcast the name, it’s easier to set up a network. On the other hand, if you don’t broadcast the name, it’s harder for random people to tap into your network. On a third hand, any savvy wireless dude with the right equipment can find your network anyway. Do what you need to do to get connected again. To encrypt your wireless connections, choose the highest level of protection that all the computers in your network can handle. WPA2 Personal helps keep people off your network unless they know the password. 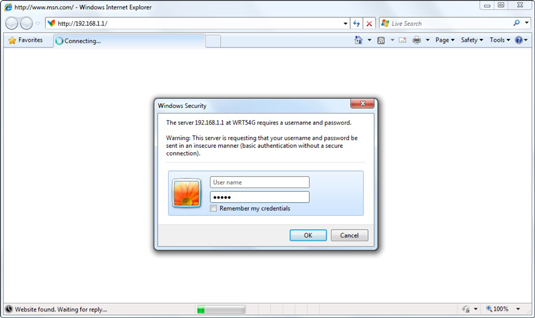 For this example, we clicked the Wireless tab and then the Wireless Security subtab. 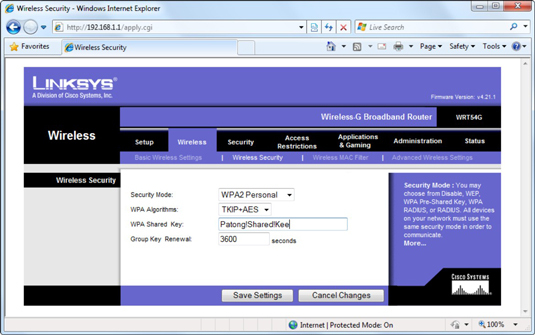 Then selected WPA2 Personal security mode and typed a shared key. Write down the security mode and key and then click Save Settings. At this point, your wireless network is set up, secure, and ready to use.